Through out the editions brief I have decided to screen print illustrations on the tote bags. But as always, the end result is far from the plan. My plan was to go into the screen printing workshop, which by the way was really informative helpful and fun, so I could start producing them. Long story short I would have an access to it only after the brief will be finished. Suddenly everything I planned and my prepared totes were put aside to be produced after we come back from the winter holidays. After having a chat with Emily she suggested for me to instead do the Risograph prints which I did not even thought of doing before for this editions project. Right now after doing some research and looking at the more and more examples of the Riso I’ve found some images that look like something I have always wanted to illustrate. Something that definitely inspires of representing the East-End and its characteristics and characters that live within this area. Idea of producing a Riso print that would not only as cool thing to buy but to make a person to have a reason to buy it. This amazing risograph print is only made with 3 colours but through playing on various tones. 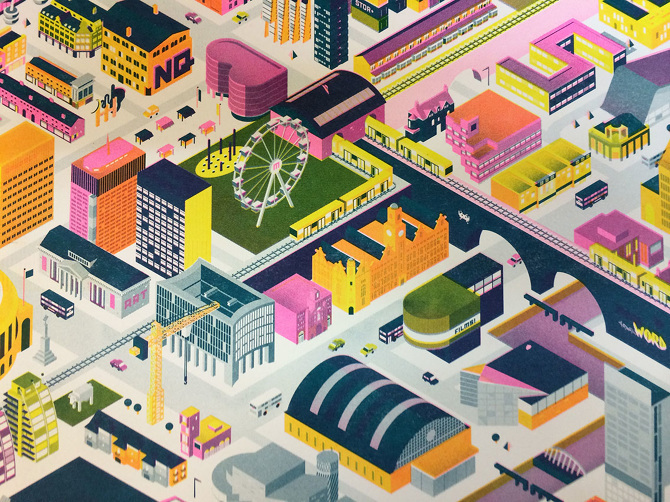 It represents city of Manchester in an isometric view. 10 editions of posters made by Jake a freelance graphic designer / illustrator based in Manchester. Click here to see more of Jake ! Also, bearing in mind my love for the Deepblue Networks illustrations of characters, I am quite sure that I could come up with my dream print if everything goes more successful this time! Putting my illustrative skills of characters and creating them into isometric view figures plus creating a map of the ‘Local Universe’ aka East-End sounds like a challenge that I’ve put on my shoulders but its more than exciting for me to start it! When nothing goes right, go awesome and do Risograph.